Description of decorations: Driftwood: mangrove, UDeco Chinese Driftwood, birch roots similar in shape and color to those presented in the nature biotope; natural sand for aquaria UDeco River Gray, 0.1-0.6 mm, leaf litter. Description of equipment: Tetra EasyCrystal 600 Filter Box Internal Aquarium Filter with Heater Compartment for aquaria 100-130 L, LED lamp AquaLighter A1-0311 12 v.
Water parameters: The temperature is 25°С, GH is 8, KH is 4, pH is 5. Description of the area surrounding the biotope: Tonle Sap Lake is located in the southeastern part of the Indochinese Peninsula on the alluvial Cambodian plain, in a depression that was formed about 25 million years ago as a part of a geological depression that was caused by the collision of the Indian subcontinent with the Eurasian plate. Analysis of the soil of the bottom of the lake and the surrounding areas proves that these places were once the seabed. The lake was once a gulf. Then the part of the land got up. The Mekong River entered the lake with sea water, so water got fresh. Then the Mekong itself shifted to the side. Now the lake is connected to the Mekong by the Tonle Sap River. This lake is the largest freshwater reservoir in Indochina. Its area can vary in size more than 5 times during a year. Lake Tonlesap in Cambodia, also called the “Cambodian Inland Sea”, is the largest body of water on the Indochinese Peninsula. The name of the lake is translated from Khmer as “a large freshwater lake”. For most of the year, the lake is relatively small (about 2,700 km²) and has depth of no more than a meter. However, during the rainy season, the Mekong River, which takes water from snow melting in the Himalayas and monsoon rainfall, overflows. The Tonle Sap River is unique: it changes direction twice a year. The increase in the water level of the Mekong leads to a change in the direction of the river. The waters of the Tonle Sap River, which connects the lake and the Mekong River, turn back and fill the lake. It floods the surrounding fields and forests over thousands of square kilometers. As a result, the area of the lake in August and September reaches 16,000 km², and its depth is 9 meters. This creates good conditions for spawning and fishing. 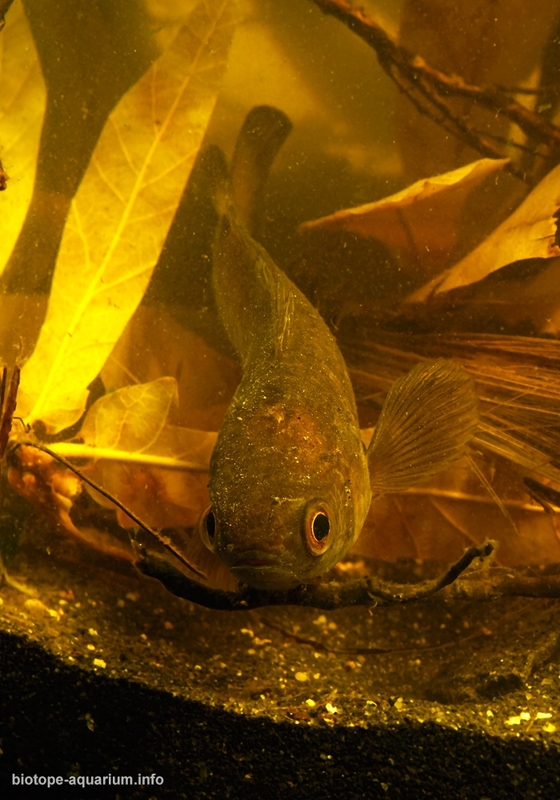 The fish in the lake is divided into 3 categories: “black”, “gray” and “white.” According to various sources, from 300 to 850 species of freshwater fish live in the lake, mainly of the carp family. When the dry season comes, the Tonle Sap river changes direction, and the lake shrinks in the area. Huge territories are covered with silt, where locals grow rice. Thus, Tonle Sap Lake is a natural buffer of the Mekong system, which allows to avoid too much flooding in the central plains of Cambodia. Description of the underwater landscape of the biotope: The Mekong River carries soil, washed from the Himalayas, into the lake. The substrate is sandstone, fine sand of yellowish-gray color. During the rainy season, the water floods vast areas of the rainforest, therefore there are many branches, drifts, fallen leaves in the water, and the bottom is covered with organic matter and silt. This creates a unique look of the lake. 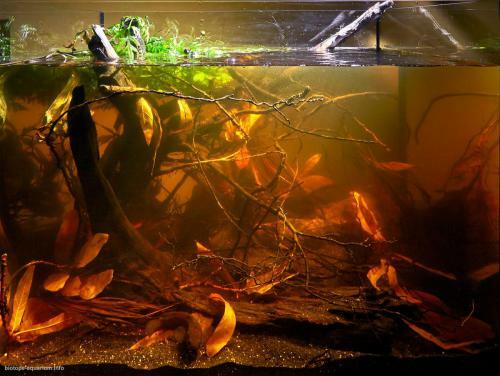 Description of the parameters of the habitat: In the rainy season, when the water rises by 8 meters and the lake increases by 5 times over the area, whole underwater forests are formed. The lake water is turbid, dark in color. When the lake is dry, the water has a yellow-brown color. The shallow water is covered with mud and a thick layer of silt, washed out by the Mekong River during the rainy period. 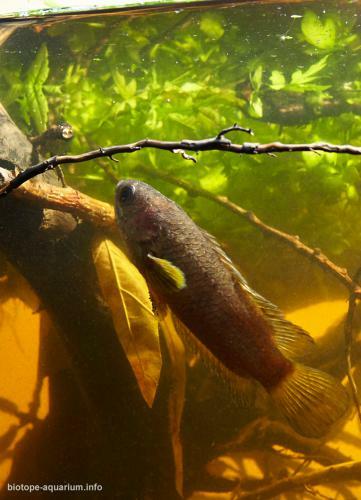 During the rainy season, tree trunks and tangled roots create conditions for spawning for numerous species of fish, some of which come from the Mekong River. On the surface of the water there are common aquatic plant colonists from South America: water hyacinth. There are almost no other aquatic plants, as well as lower algae. When the volume of water in the Mekong decreases and the water begins to go down, the Tonle Sap river changes direction and begins to flow towards the Mekong. The lake begins to shallow, and the “black fish” prepares to wait out a period of drought in the mud, the “gray fish” moves to numerous tributaries, and the “white fish” returns to the Mekong and goes upstream. 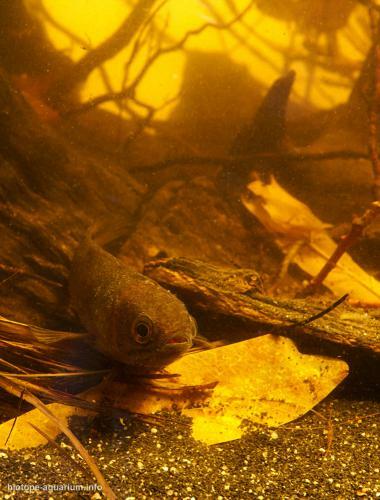 During the dry period, the water temperature rises to 30°C, the amount of oxygen in the water decreases sharply, therefore only a double-breathing fish remains in the lake. These are the most characteristic and integral elements of a biotope. 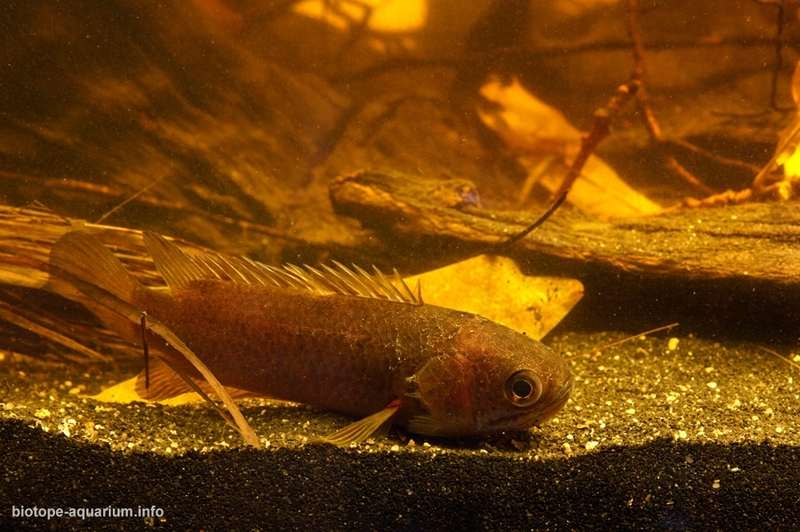 List of fishes and invertebrates occurring in the nature biotope: Anabas testudineus, Parambassis siamensis, Pangasianodon hypophthalmus, Clarias nieuhofii, Сhanna micropeltes, Сhanna striata, Carassius mekongensis, Catlocarpio siamensis, Oxyeleotris marmorata, Barbonymus gonionotus. List of plants found in the nature biotope: Eichhornia crassipes, Ceratopteris cornuta. Threats to the ecology: The aquarium was created to attract attention to the Tonle Sap lake. One million Cambodians directly depends on the Tonle Sap lake. 90% of these people have houses built on stilts in the lake, and 10% live in floating villages. There are 170 fishing villages in Tonle Sap. This lake is famous for its abundance of fish and is the fourth largest source of freshwater fish in the world. Fishermen can catch 300,000 tons of fish per year, which is 75% of Cambodia’s freshwater fishery. The lake’s productivity is ten tons of fish per square kilometer. There are cases when fishermen overload their boats with their catch and turn over. 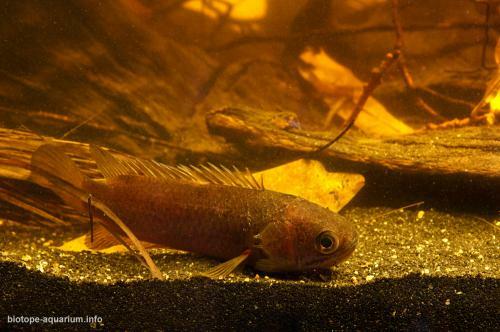 Many species of fish, shrimp and mollusks live here, and the lake itself is one of the most productive freshwater resources in the world. But the ichthyofauna of the Tonle Sap lake is not well understood. People living in these areas are allowed to fish in the lake in accordance with fish law in Cambodia. Illegal fishing and poaching are the main problems that threaten fish populations. Deforestation for agriculture is also a serious problem. Many of the people who live around the lake are extremely poor and totally dependent on the lake. All waste products of the people are thrown into the lake, which significantly pollutes the water in it. In recent years, the number of large fish has decreased, and people, providing themselves and their families with fish, in turn, increase the threats and dangers to the lake. In addition, farmers build canals for irrigating rice fields, which leads to a decrease in the amount of water in the areas of fishing. Farmers use pesticides for their crops, which can get into the water and pollute it. In the dry period, when the water level in the lake drops to the minimum (1 meter of depth), the strip of flooded forest 20-30 km wide remains dry. 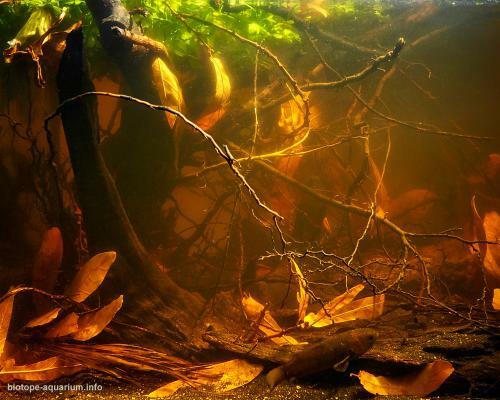 This area is called the “underwater forest” because tree trunks and parts of foliage – and sometimes whole trees – are flooded annually for several months. This large flooded forest is of great importance as a breeding ground for fish. Accordingly, the season of laying eggs is from August till October. In recent decades, the Tonle Sap freshwater swamp forest has been threatened with deforestation. In this regard, the Tonle Sap Lake was listed in the UNESCO Biosphere List in 1997. Fortunately, in 2001, the Prek Toal biosphere reserve was established by the royal decree of the Cambodian government south of the village of Prek Toal. Its task is to perform 3 main functions: a) the preservation of biological diversity, landscapes and ecosystems, including genetic resources, plants, fish and animals; b) promoting the sustainable development of ecology, environment, and culture; c) supporting environmental education, research and environmental monitoring for nature conservation.